*Disclaimer - I received the coupons and a gift card to facilitate this post and am hosting the giveaway in this post. Are you excited about Hotel Transylvania 3? Then go get the themed Little Bites muffins! I am really excited about the new movie, Hotel Transylvania 3 coming out on blu-ray and DVD Oct 9! Our kids are excited to see it too, and we just love Little Bites muffins and are loving the new HT3 themed ones that are out. 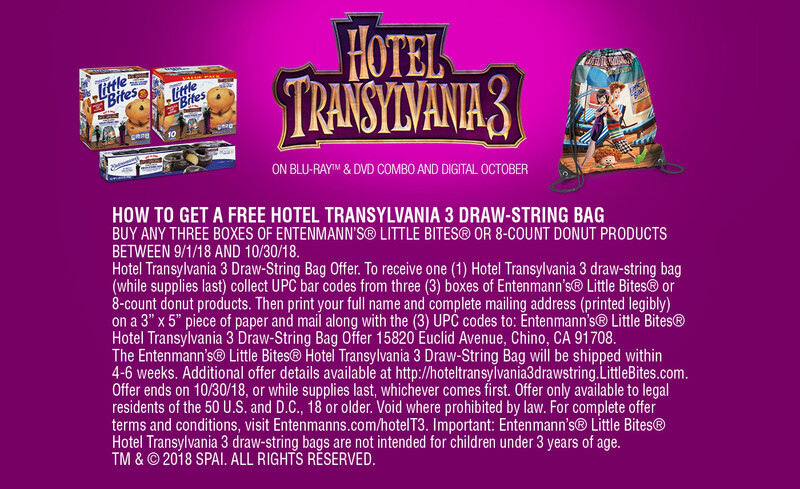 See the information in the picture below to see how you can get a FREE Hotel Transylvania 3 drawstring bag!! 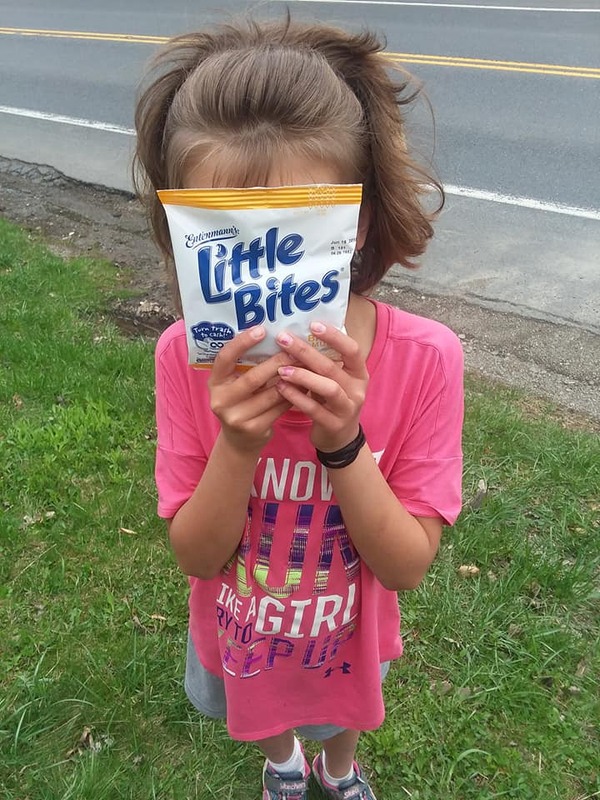 Sony Pictures Home Entertainment, Entenmann’s® Little Bites® is bringing Hotel Transylvania 3 (HT3) from the big screen to snack time with a frightfully delicious offer—and they want you to join in on the fun! 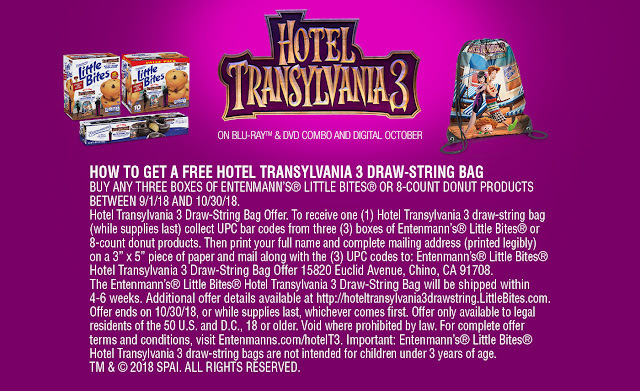 Timed to the Digital (9/25) and Blu-ray & DVD Combo (10/9) release of HT3, the purchase of any three five-count Entenmann’s® Little Bites® or three eight-count Entenmann’s® donut products, will garner you the opportunity to receive a free HT3 draw-string bag. A Drac’s pack-approved snack, Entenmann’s® Little Bites® are moist, delicious mini muffins that the whole family can enjoy while indulging in the newly released movie together. GIVEAWAY ENDS ON OCT 1. I would love to see more easy recipes for meal plan. I like revuews of kids toys. I would like to see more of your product reviews for kids. I would love to see what the projected hot, new toys are to be for this holiday season. I like to find new slow cooker recipes. I haven't tried the Little Bites yet, but they look yummy. I would love to see more delicious recipes as well as posts on great deals and coupons. I would love to see some fun and spooky Halloween themed snacks. I love topics on healthy, but fast recipes. I really enjoy sheet pan or one pot meals. I love cleaning hacks - anything to make the task easier. I'd like to see some kid's movie reviews. Honest ones that aren't fluffed. I like reviews of baby products. would like to see more crock pot recipes. I’d love to see cleaning ideas, recipes, at-home activities/crafts for kids. I always love to see easy, fairly quick recipes. And the occasional more complicated recipe, lol. Recipes. I am a recipe hog. I love to see new ones and especially easy ones as we have entered hockey season!